Are you looking to stand out on Facebook? 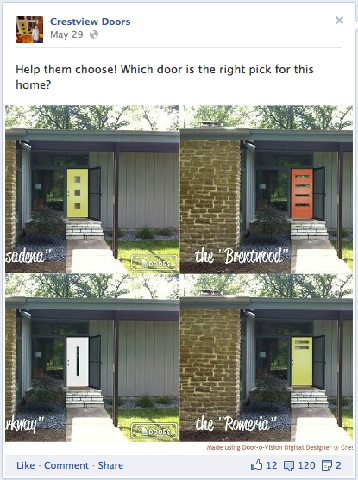 Christiane Erwin, owner of Crestview Doors of Austin, TX, logged onto Facebook early one morning and was surprised. She saw one of her company’s door designs in a photo post from home superstore Lowe’s. 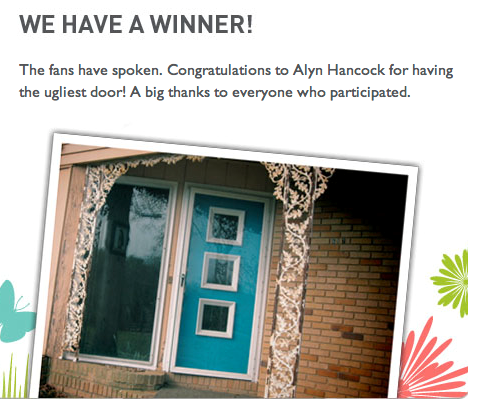 Unfortunately it was as the winner of the Lowe’s Ugly Door Sweepstakes. The winner of the Lowe's Ugly Door Sweepstakes. Crestview is a small door manufacturer specializing in mid-century modern architecture. Erwin knows that it’s not everyone’s favorite style, but she also knows that mid-mod fans are a devoted and stalwart bunch that had just been insulted on a question of taste. Due to a savvy Facebook strategy that plays to its strengths, Crestview was perfectly poised to take advantage of the opportunity to play David to Lowe’s Goliath, and increased its reach more than four-fold over the course of the week in the process. 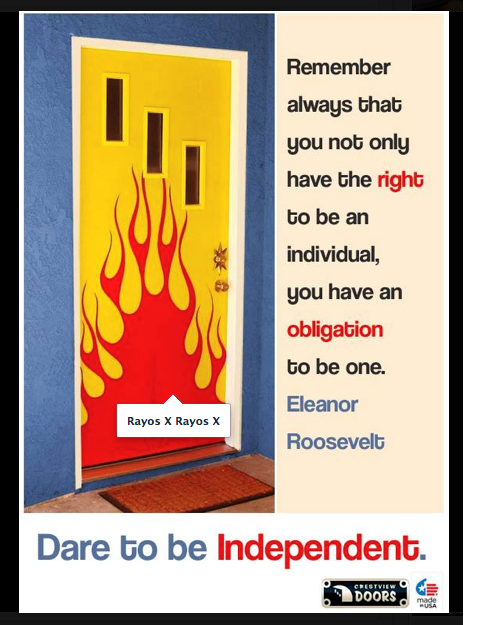 Crestview's succinct response to the Lowe's Ugly Door Sweepstakes announcement. The response garnered 181 likes, 18 shares—including one from the influential mid-mod site Retro Renovation—and 120 comments. It also brought them 40 new fans, up from a daily average of 5. Crestview was able to capitalize on the opportunity because of the thought they had put into recognizing their true mission and how their Facebook fans fit into that mission. Crestview realized that their mission as a business is not selling doors, but bringing back mid-century design to the home décor market. They also recognized that their fans’ value lies less in becoming repeat customers than in evangelizing their brand and mission. To cultivate brand evangelists on Facebook, Crestview has four techniques: get personal, get visual, value your fans’ contributions and measure your results. Here’s how they do it. When the company started using Facebook in 2009, “We did what a lot of small businesses were doing. We posted about sales, or new products, or ‘Have you seen this?’ articles about something that wasn’t getting much traffic on the site,” said Erwin. Results, however, were lackluster. Building a fan base was slow, and after over two years of effort, they were still hovering near 1,000 fans. They experimented with Facebook Ads (spending approximately $600 per month), and later with paid posts, but were disappointed with the return on investment. “The relevancy of the ads was always very short, and it wasn’t really driving sales,” Erwin said. Then, quite by accident, Erwin’s husband, co-owner of the company, posted an old family photo to the Crestview page that was meant for his personal account. The "accidental" post that triggered Crestview's new Facebook strategy. By the time they realized the mistake, they figured they would just leave it up. 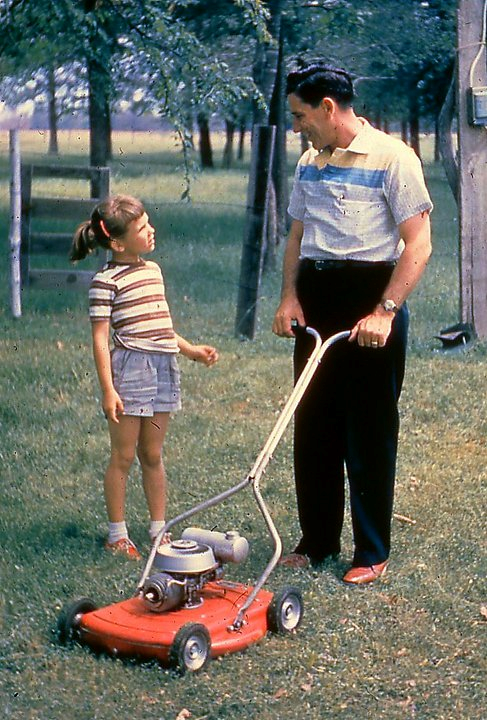 It was from the ’50s after all, and Facebook posts have a short shelf life anyway. Soon the photo had gotten 7 likes, “which at the time was a good number for us,” said Erwin. The company started experimenting with a more informal posting style, and noticed that the more personal their posts were, the more comments they got. 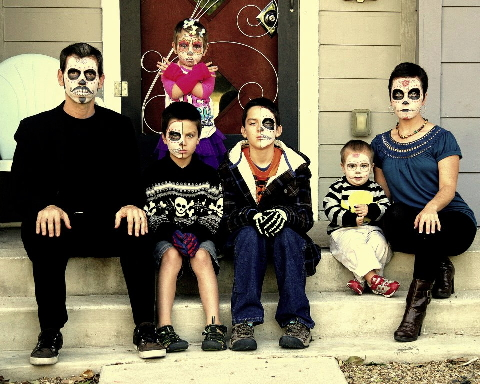 Crestview Doors' family Halloween portrait posted to their Facebook page. By studying their analytics, Erwin and her husband discovered that their most important metrics are shares and reach. And what drives shares? Visuals. “We figured out that posting a photo with every status update is very important. People won’t share words, but they will share pictures,” said Erwin. Including a photo in each post, no matter how irrelevant it may seem, is now a “no-brainer,” she said. Distinctive photos are a key element of Crestview's Facebook strategy. Door-O-Vision, a feature on the company’s website, lets customers virtually model four different door designs on their home. The terms of service allow Crestview to share the results on their Facebook page, so Erwin will often post the four-up photos and ask fans which one they think is best. The result is always an outpouring of comments and shares. A four-up Door-O-Vision photo gets shared on Facebook. To encourage their brand evangelists, Crestview also celebrates fans’ successes, whether or not they are customers. Crestview loves to celebrate fans' fabulous find. 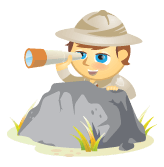 Any marketing effort’s effectiveness can only be determined by tracking results. Since Crestview was keeping track of their Facebook stats, they could see right away the bump in response from the accidental post by Erwin’s husband. They could also see an increase in new fans per week starting in mid-2011 when they began posting more informal messages. Despite a decline in the rate of new fans once Facebook switched to Timeline, the company has nearly quintupled its Facebook fans in the past year. But fans alone won’t contribute to the bottom line. 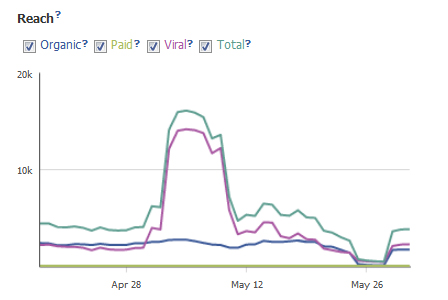 Google Analytics data tells Crestview that Facebook currently drives 7.1% of online sales, with no monetary outlay. Custom millwork sales, which account for 50% of the company’s revenue and often come through other channels, are more difficult to track, but Erwin is confident that their Facebook presence plays a part. Crestview experienced a significant bump in reach from the Ugly Door Sweepstakes response. What do you think? Has your business experimented with more personal or informal posts on Facebook? What has your result been? Post your comments and questions in the box below. Louise is Social Media Examiner’s case study writer. A freelance writer and former engineer, she has a passion for telling compelling true stories. Follow Louise on Twitter @LouiseJulig.